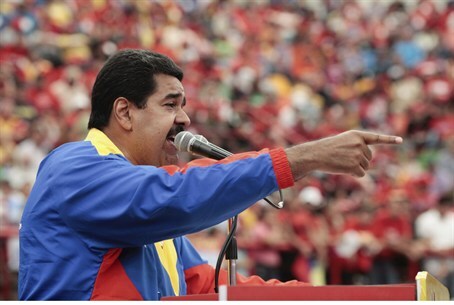 Acting Venezuelan President Nicolas Maduro on Saturday accused the country's opposition of being "heirs of Hitler." Acting Venezuelan President Nicolas Maduro on Saturday called the country's opposition "heirs of Hitler," accusing them of persecuting Cuban doctors and artists working in the South American country the way the Nazis persecuted Jews during the Holocaust. "The campaign against Cuba is just like the campaign against the Jews in Hitler's Germany," Maduro said during a campaign rally. "The heirs of Hitler are leading a campaign in Venezuela against the people of Cuba," he said. Chavez named Maduro, his vice-president, as his preferred successor before dying of cancer on March 5. Maduro must now run for office in a special election to complete the late leader's term. He is running against rival Henrique Capriles, candidate of the unified opposition, who was defeated by Chavez in an October vote. At the time, Chavez slammed Capriles as a pampered member of the "rancid oligarchy" who was taking orders from Washington. Government sympathizers have also described Capriles as a "Nazi" and "fascist", as he is of Polish Jewish descent on his mother's side, despite at present ascribing to the Catholic faith. A mid-March poll of 1,100 people by the firm Hinterlaces shows Maduro with 53 percent support against 35 percent for Capriles. Anti-Semitism in Venezuela sky-rocketed in recent years, resulting in a dramatic reduction in Jewish population. Before Chavez came to power, the Jewish community amounted to approximately 30,000, while today its numbers reach a mere 9,000.